Provenance: The Gallery of Julius Böhler Munich, Gallery Douglas, bought by HM King Alexander I in 1932. The painting of the Presentation of the Virgin has a very interesting and curious history. The painting was bought by HM King Alexander in 1932 as a work of the famous German Renaissance artist Altdorfer. From its very entrance into the collection it was considered one of the most important works in the collection and was exhibited in the central hall of the White Palace. Nowadays it is kept in the hall of the Royal Palace in the Royal Compound. On the basis of the latest discoveries, and the assistance of scholars from KHM, Vienna and Art Institute Chicago, this work can to ascribed, with great certainty, to the Master of Pulkau, an artist active in Austria and Bavaria in the first decades of the 16th century. 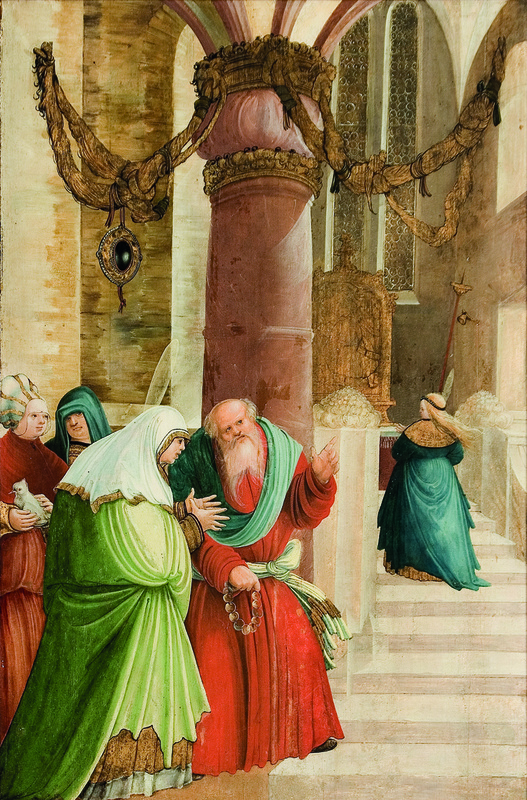 It is assumed that this interesting Renaissance artist was one of the first pupils of Altdorfer, and for that reason his works were long attributed to Altdorfer himself. New research has discovered that the image of the Presentation was initially a part of the doors of the great altarpiece that covered the sculpted shrine. While the Presentation (due to its rich decoration and the subtlety of its execution) most probably stood on the outer side of the doors, the inner side was decorated with the image of the Nativity presently kept in the collection of the Art Institute of Chicago. Both of these works came from the gallery of Julius Böhler in Munich: The Presentation was bought by HM King Alexander I in 1932, and Nativity for AIC in 1933. Since the Presentation was from the very beginning in the Royal Compound in Belgrade and therefore not open to the general public, until recently it was considered to be a work in an unknown location. Close examination of both works reveals great stylistic and compositional similarities. The faces and the drapery were executed in the same way, while the treatment of space in both is of particular interest. The space in the upper part of the painting, the ceiling of the barn in Nativity and the vaults of the cathedral in the Presentation, was composed in the similar fashion with the specific spatial complexity. The overlapped beams adorned with the blades of hay, in the Nativity, and interwoven elaborate garlands and arches in the Presentation, represent almost an echo of the one space in the another. This dialogue of two pictorial spaces was of great importance for the function of the winged altarpiece. By opening of its doors, one image merged with the other, one space reflected the other, both offering the beholder a “moving image “of Biblical history, a history of which he became an immediate witness. The rediscovery of this almost forgotten work of Master of Pulkau is of utmost significance. For that very reason, the Presentation would have the pride of place in the great exhibition devoted to Altdorfer and his pupils that is jointly organized by Stadel museum in Frankfurt and KHM Vienna – Realms of imagination (November 2014-February 2015 Frankfurt, March – June 2015 Vienna). 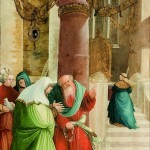 On this exhibition, first time after many centuries, two panels from the same altar Presentation from HM King Alexander I and Nativity from Chicago, would be reunited, and the audience would have the unique opportunity to perceive the true importance of this complex religious painting.